Tom brought an amazing P2k single-sheathed boxcar - one of the "Timesaver" kits that already has all the grabs installed. 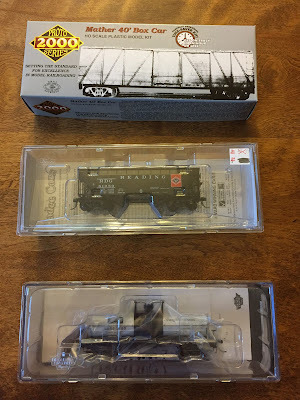 So, basically, I'll be able to add a craftsman-quality kit to the layout in about the time it would take for me to assemble a "shake the box" kit. And - bonus! - it even has the right date data already on it. Don't even have to change that! Thanks Tom! And Randy brought a much-needed hopper by KD. Coal business is still in full swing, though starting to wane, on the Valley Line in the late 40s, so my hopper roster can always use another addition. Thanks much to Randy, that roster continues to grow! Randy also - acting as unofficial UPS guy - "couriered" a purchase of another Stauffer tank car. I only have a few of these, and they're very distinctive. They're also critical to have on the Valley Line as these cars are one of the few mentioned by name in John Wallace's reminisces of operating on the Valley. They were commonly consigned to Hartford Rayon in Dividend (south side of Rocky Hill). Unfortunately, models are not all that common and I don't feel like scratchbuilding them, so whenever a model's produced, I try and get it. Thanks again to Randy for the delivery. And finally, after long last and many years of dedicated effort, Max's book is finally out - and delivered (and signed by) the Author himself! I first got the good news this book was starting production back in March (see that post here), but now it's actually available in all its glory. 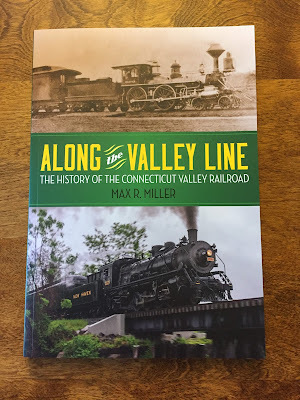 It's an absolute must-have for the Valley Line aficionado, and any fan of New England railroading. You can order it at Amazon here - even though it says it's not available until Sept. 5, I know for a fact they're already being shipped out. So get your copy while you can (only a few left at Amazon as of this writing). So LOTS of fun to share this Friday! Hope you and yours have a wonderful holiday weekend!